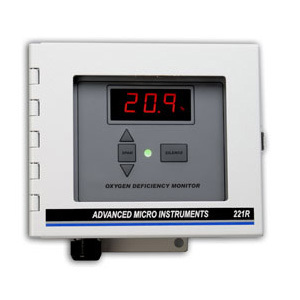 Percent Oxygen Deficiency Monitor. Single range of 0 – 25%. 2 factory set concentration alarms at 19.5% and 20% O2. Wall Mount. The Model 221 employs a very accurate and responsive 10- year life zirconium oxide sensor that operates with unmatched stability over its entire life. Sensor requires no support gases and can be easily and accurately calibrated using compressed air within 30sec. on an annual basis. Also included in this package are 2 factory preset Caution (20.0%) and Danger (19.5%) oxygen concentration alarm relays, a 90db audible beeper set for 19.5%, battery backupand an internal circulation fan that helps move stationary room air. The Model 221 is a compact, rugged, RFI proof oxygen analyzer utilizing state-of-the-art analog basedelectronics with a large 3½ digit LCD. UL approved.